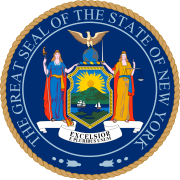 The 1928 New York state elections were held on November 6, 1928, to elect the Governor, the Lieutenant Governor, the State Comptroller, the Attorney General, a U.S. Senator and a judge of the New York Court of Appeals, as well as all members of the New York State Assembly and the New York State Senate. The Workers state convention met on June 10. The Socialist state convention met on July 15 at Albany, New York. The Republican state convention met on September 29 at Syracuse, New York. The Democratic state convention met on October 2 at Rochester, New York. Four Democrats and two Republicans were elected in a tight race. The incumbents Tremaine and Copeland were re-elected. The Democratic, Republican and Socialist parties maintained automatic ballot access, the Socialist Labor Party did not re-attain it, and the Workers Party did not attain it. ^ Hezekiah D. Wilcox (Jan 24., 1855 - Dec. 18, 1931), lawyer, of Elmira, ran also for the Court of Appeals in 1916, 1917, 1921 and 1927; and for Attorney General in 1918, 1922 and 1926; Obit in NYT on December 19, 1931. Wilcox was actually ineligible for this office, since he had passed already the constitutional age limit of 70 years.